"The New Komeito will without question become bindings on your hands and feet." The term Ishihara used -- ashide matoi (足手まとい） -- is a pejorative, usually referring to clingy, needful persons rather than actual physical bindings. "What I am saying is the truth." So, a sign of the apocalypse: Ishihara Shintaro and MTC in agreement -- with the caveat that the Blinking One and I may not be copping the same attitude. The great unfulfilled dream of the LDP is the revision of Article 9 of the Constitution. If the LDP joins forces with the JRA after the House of Councillors elections, the two parties could, with help from conservative independents and the DINOs inside the Democratic Party of Japan, get within striking distance of the 2/3rds majorities in both Houses of the Diet necessary for putting revisions of the Constitution to a national referendum. 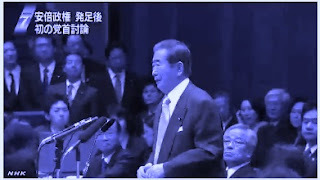 One of the explanations for the pacifist New Komeito's continuing alliance with the LDP, an alliance that has persisted through thick and thin, with the New Komeito seeing its entire leadership go down to defeat in 2009, has been that the tie up keeps the LDP's commitment toward revision of Article 9 on an aspirational level. The warning is something of a non sequitur. There is, as far as anyone knows, no national consensus on the LDP and the New Komeito controlling the government. However, because the two parties did well in the December 2012 elections, they do. As for constitutional revision, the same principle should apply: if you have the votes, everything's on the table. Consensus is nice but nowhere in the rules. Only a believer in essentialist myths about a Japanese way would insist upon consensus being a prerequisite for action. We might be seeing Hashimoto paying a rare courtesy call on New Komeito members, asking them to quietly ignore the Sick Old Man and his "truths." If the language of Article 9 can be construed as not impeding an armed and ready GSDF from driving around hither and yon in faraway conflict zones looking for folks to rescue, the imperative for revision of the article seems rather weak. Later - For an English language report on the Cabinet Decision from Kyodo News via The Japan Times, click here.